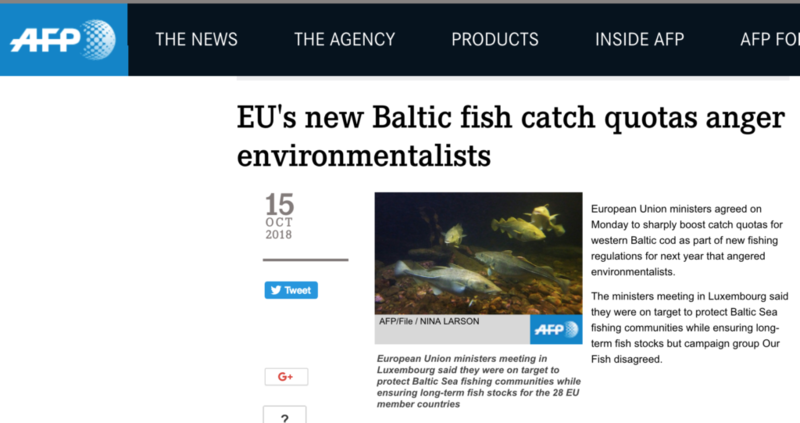 European Union ministers agreed on Monday to sharply boost catch quotas for western Baltic cod as part of new fishing regulations for next year that angered environmentalists. Member state ministers set the quota for western cod at 9,515 tonnes for 2019, an increase of 70 percent over this year, even though the European Commission, the EU executive, called for limiting the increase to 31 percent. They put the limit for eastern cod at 24,112 tonnes, 15 percent less than currently and the same quota the commission supported. The ministers set the quota for western herring at 9,001 tonnes, a reduction of 48 percent, though the commission had called for a reduction of 63 percent. The quota for main basin salmon was rolled over at 91,132 tonnes, even though the commission recommended an increase of 15 percent. For salmon in the Gulf of Finland, the quotas were reduced by three percent to 9,703 tonnes, against the commission proposal of one percent less. The ministers also called for reducing quotas for central herring, down 26 percent to 170,360 tonnes, and Bothnian herring down seven percent to 88,703 tonnes. However, the quota for Riga herring will increase by seven percent to 31,044 tonnes. Quotas for plaice will jump by 43 percent to 10,122 tonnes and those for sprat by three percent to 270,772 tonnes.